You've seen The Lord of the Rings movie, now collect these wonderfully detailed action figures. 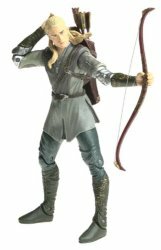 Legolas the elf and son of the king of the woodland realm of Mirkwood comes complete with dagger-throwing and arrow-launching actions. This figure is wonderfully detailed and comes complete with his own bow, four arrows and two knives. Good job Vivid Imaginations provided four arrows, as I lost one after only minutes of playing after I tried to shoot the cat - serves me right I suppose. This figure will make a wonderful addition to your collection and will give you hours of fun - it did me anyway. At £10.99 you are not going to be breaking the bank either. After all is said and done this is just, after all, a plastic figure, but the detail has certainly come on since I last collected anything like this and the presentation is also well designed.